The Internet of Things is a new concept to us. But if we think about it, Internet access is nothing new. We come across many “things” in day-to-day life. They help make our life easier each day. For example, take an ordinary light bulb. It consumes energy and produces light, which helps us see every day. Technology and improvements have stripped down resource consumption to the bare minimum. They optimize the output, and now we have an era where the mobile and telecommunications industry are booming. The speed of the Internet is unimaginable compared to the past. From that, we have the idea of making things “smarter” by connecting them to the Internet, analyzing petabytes of historical and real-time data, and automating their operation. This results in a smarter way of living. The Internet of Things affects almost all major areas of the industry: agriculture, health care, home automation, and many more. 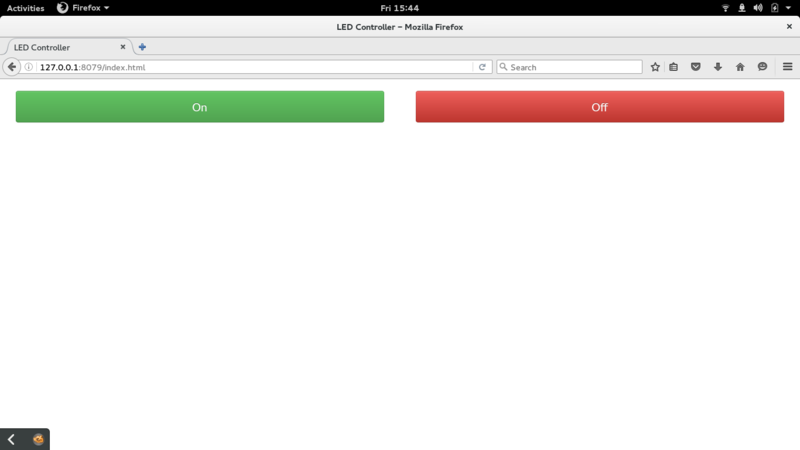 It is now easy to control a light on an Arduino without an Ethernet shield, but just over HTTP. The idea is to let you control a single bulb or series of bulbs in your home from the tap of an application on your device. Arduino UNO is what we will use as the micro-controller for the switch. In this guide, the Arduino board will control a light. To keep things simple, we will use Pin13 of the Arduino for the light source. This is a LED light in the Arduino itself. An Ethernet or WiFi shield is not used. To get started, you will need the Arduino integrated development environment, or IDE. If you are using Fedora, you can install the official Arduino IDE with a single command in a terminal. Once installed, make sure that you plug in your Arduino and check if your system detects it. 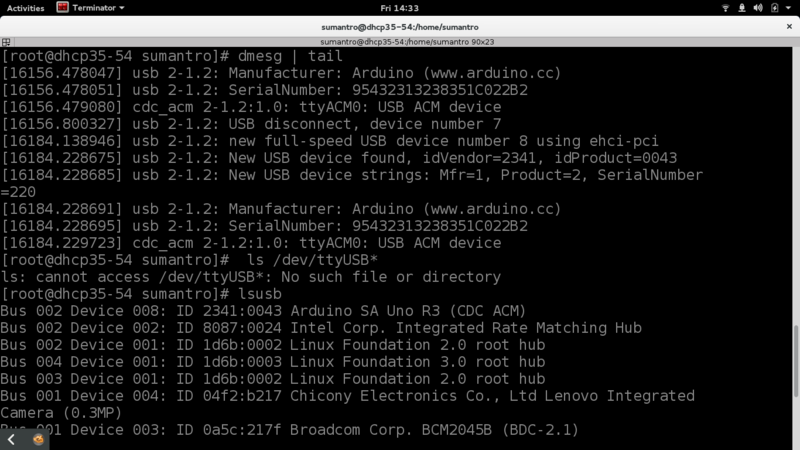 After inserting the USB into your system, enter the terminal and look for where the system is registering the Arduino. You will need this information later on to execute the code you will make with the Arduino IDE. The following command should tell you of its place.
. Once you find the board, we can move ahead to setting up the communication protocol. To install and set up Johnny-Five, open the Arduino IDE we installed in the previous step (if you’re using GNOME, it should be in the Applications menu). In the IDE, go to File > Examples > Firmata > StandardFirmata. We’re going to upload the StandardFirmata to the Arduino board for us to use when creating the switch. StandardFirmata is available in all versions of Firmata greater than v2.5.0. Once you find this in the Arduino IDE, hit the “Upload” button to push the firmware to the Arduino board. If the upload was successful, the board is prepared for us to use, and you can now close the Arduino IDE. You can find my demo code available on GitHub. For this project, you will want a copy of the index.html and LED_Server.js files. You can copy and paste the two files into the project workspace you created earlier. Now that we have our workspace and files needed for running the project, we will need to set up a Node.js server to run the application. To begin with running the “light switch server”, you will need to install Node.js and NPM, the package manager for Node.js applications. Enter the following commands to install the necessary dependencies. Once all the dependencies are installed, you will now be able to start your light switch server. 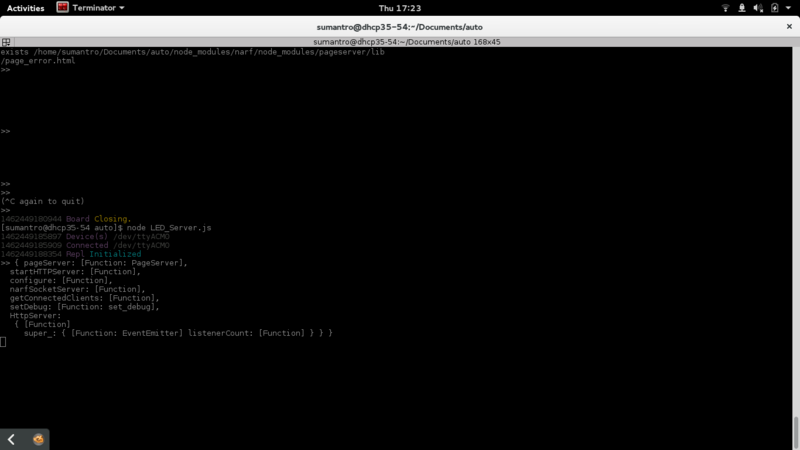 Making sure you are in the project workspace folder, enter the following command to start the Node.js server. Once you execute the command, your terminal window should look like the following. The application will now be running. To test if it’s working, open up your favorite browser and point it at http://127.0.0.1:8079/index.html. This is the address of a local page on your system where you can view the virtual power switch we created. Now, you can control the power for Pin13 on your Arduino board from this webpage. In this proof of concept, you will only be able to control the LED light on the Arduino. However, in a more realistic example, perhaps you leave for a vacation and can’t remember if you turned off the lamp next to your bed while you were packing. This solution would allow you power off the lamp from anywhere in the world at any time. Here is how the web page looks in action from the above example. That’s what “arduino ide” do when open up first time. Maybe any idea on how this can work for AC power bulbs. Great article! would love to see more like this. This is fun! I recently got my hands on Arduino Leonardo with an Ethernet+SD shield, a Proto Shield and a light sensor add-on. Thanks to this article I might be motivated enough to do some work on it finally ;). Cheers to all fellow Fedorians! Please, can you start a serie over arduino?! I have arduino uno and i dont konow what to do with it. So you replaced the ethernet shield with a whole PC ? This is just an example. There are many people that have computers turned on all the time and plug an arduino to one of those computers make sense. If you don’t have a computer turned on all the time, then maybe it will make sense use a Ethernet shield as you pointed out. You will also need a power source for the arduino, not only the Ethernet shield.